I have always found business development to be fascinating, the process of merging the efforts of two or more companies to create or enhance a marketing strategy. Whether another company is bringing a new idea to me or vice versa, the conversation is almost always stimulating. The merits of the idea go round the table, sometimes round and round the table, and each party alternately tries to make the shoe fit. I have many times sat in on meetings where such an idea is being evaluated. Naturally, when two or more companies co-venture an effort there are many considerations and unexpected possibilities. Everyone has their own goals to fit into the mutual objective. It can be a challenging undertaking in any instance. Even when the idea fails to materialize into action, however, the effort is seldom wasted. I value such conversations for the many sparks arising from striking two companies against each other, and I always, always, invite the representatives of the other company to continue to seek out ways for us to work together even when our initial idea hits a brick wall. And for good reason. Here’s the thing: most ideas are doomed from the outset, and even the best ideas require the right people. The idea is not the essential ingredient, but people are. One of the failings I often see is an over-valuation of the idea rather than an appropriate emphasis on the people who bring the idea to the fore. I want good people with whom to work. Together, we can find a good idea. Actually, good ideas are everywhere. Good people, though, are more scarce. 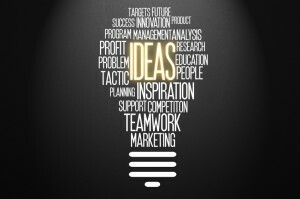 The person who can consistently bring me new ideas is typically more valuable than any single idea. I have too often seen a relationship between companies fail to materialize simply because one party devalues the idea sparking the start-up discussion. Give me an idea person with the capability and passion of making an idea materialize and I’ll show you the beginnings of a new undertaking with a real chance of making it work. So thanks to the TRO and Voyager staff. Thanks to all of our writers and contributors. People make companies work. I am fortunate to have surrounded myself with great people. They make me look good. We should all be so fortunate. In the next few weeks, TRO and partner companies will be releasing some exciting new programs. Some of those were developed internally by good people. Some were developed externally and brought to us by good people. In every instance, however, the travel professional community will stand to benefit immensely, not merely because of an idea, but because those ideas were manifested by good people. In your own business, always remain watchful for a good idea. But pay more attention to the person bringing you the idea than the idea itself. From my perspective, people are more important than ideas. You can give a great idea to a mediocre person and it will go nowhere. You can give a mediocre idea to a great person, however, and it can catch fire. It’s people who are valuable, not ideas. I’d rather have an good upstart than a good start-up any day.